The state bird of Maryland is one of the most welcome spring arrivals in the East. A few winter in the US; sometimes one is even found at a feeder in a northern state. 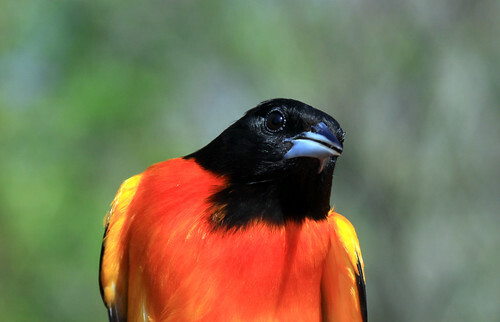 During spring migration, orioles are often attracted to oranges cut in half; they enjoy grape jelly throughout summer and fall as well, but jelly is not nutritious for their young, and when offered in large quantities can entrap other birds or even the orioles.